Steampunk has been one of the constants in my reading life since I started blogging. The genre's fun meld of speculative fiction, science, and the allure of the Victorian age seemed to hit peak popularity at the same time that I was rediscovering young adult fiction. In order to keep myself motivated to read the latest and greatest in an area I pretend to know something about, I hatched a plan. Next week I’ll be blogging up a storm with an *event* that I created on a whim and a sugar high. I’m making it up as I go, with some generous inspiration from previous steampink events organized by V of vvb32reads. It’ll be fabulous. 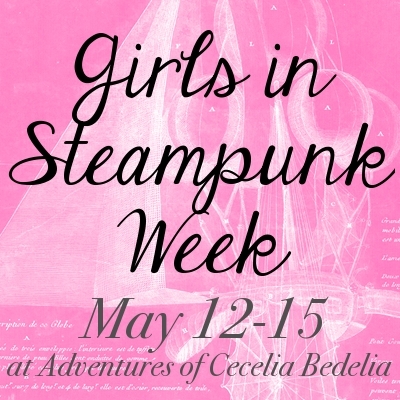 Look out for Girls in Steampunk Week at Adventures of Cecelia Bedelia from May 12-15. I’ll be reviewing recent steampunk releases that feature strong female leads, hosting a giveaway or two, and I'll probably throw a meme in for good measure. Best of all, my delightful (real life!) sister Ginny made a fancy button for the occasion. If you’d like to check back here for Girls in Steampunk Week content, it’ll be in the sidebar, available at the click of a button. From the 12th on, the image will lead directly to the calendar of events/reviews. If you don’t know what steampunk is, please check out this description, then come back next week for more fun in worlds both strange and fantastic.